We’d love your help. Let us know what’s wrong with this preview of Eternal Ephemera by Niles Eldredge. One of evolution's fundamental questions is how the skein of life on Earth remains unbroken yet is constantly renewed by new species. What accounts for the scientific paradox that all organisms and species are ephemeral, and yet life endures, yielding more advanced players in nature's eternal play? In this riveting work, renowned scientist Niles Eldredge presents a magiste One of evolution's fundamental questions is how the skein of life on Earth remains unbroken yet is constantly renewed by new species. What accounts for the scientific paradox that all organisms and species are ephemeral, and yet life endures, yielding more advanced players in nature's eternal play? In this riveting work, renowned scientist Niles Eldredge presents a magisterial account of leading thinkers as they wrestle with this paradox over a span of two hundred years. Eldredge begins in France with Jean Baptiste Lamarck, who in 1802 first framed the overarching question about new species. Giambatista Brocchi followed, bringing in geology and paleontology to expand the question. In 1825, at the University of Edinburgh, Robert Grant and Robert Jameson introduce these astounding ideas to a young medical student named Charles Darwin. Who can doubt that Darwin left for his voyage in 1831 filled with these daring, new ideas about the "transmutation" of species, well cultivated by earlier thinkers tilling this rugged and contentious intellectual ground? To ask other readers questions about Eternal Ephemera, please sign up. Anti-science sentiments rise to the top periodically whether it be from anti-vaxxers, climate-change deniers, or adherents of intelligent design. I am a strongly pro-science person and a fan of science fiction which at its basis should understand science and then speculate from that strong understanding. At times, it's nice to dig into a nonfiction book for a fresh perspective. Personally, I've been a fan of the writings of Stephen Jay Gould, which brings me to this book--the most recent by Nile Anti-science sentiments rise to the top periodically whether it be from anti-vaxxers, climate-change deniers, or adherents of intelligent design. I am a strongly pro-science person and a fan of science fiction which at its basis should understand science and then speculate from that strong understanding. At times, it's nice to dig into a nonfiction book for a fresh perspective. Personally, I've been a fan of the writings of Stephen Jay Gould, which brings me to this book--the most recent by Niles Eldredge who co-wrote with Gould a controversial essay early in their careers promoting the idea of punctuated equilibria. Essentially, evolution is happening, but not at the constant deeply gradual pace that has often been conjectured. Rather, it usually happens in concentrated bursts by micro-populations that have become isolated from the core range and population of a given species. This book is largely making the same argument forty years later, while needlessly defending itself from accusations of being anti-Darwinian. Niles Eldredge’s book, Eternal Ephemera (2015), is about the evolution of evolution. His narrative pulls together quite nicely the entire history of biological evolution, a topic I touch on in A World Perspective through 21st Century Eyes, in the context of the first of a series of evolutions affecting humanity – followed by cultural evolution and then technological evolution. Some philosophers view the “goal” of biological evolution to maximize adaptive, hence reproductive, success. 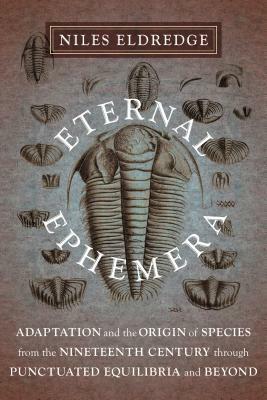 It’s viewed Niles Eldredge’s book, Eternal Ephemera (2015), is about the evolution of evolution. His narrative pulls together quite nicely the entire history of biological evolution, a topic I touch on in A World Perspective through 21st Century Eyes, in the context of the first of a series of evolutions affecting humanity – followed by cultural evolution and then technological evolution. His well known theory of punctuated equilibria is rooted in two observations: geographic species replacement in the environment and stasis, an observation that once species appear they become relatively stable for up to millions of years. To be sure, organisms change throughout their lives, but do not evolve. It is their genes that evolve. And, of course, the species evolve. In Richard Dawkins’ book The Selfish Gene (1976) he argued that our genes competitively contend for representation in the next generation. Information the genes contain is passed down. This part of the narrative was very intriguing to me. Eldredge, who is one of the few scientists who studied the original works of Darwin, revealed that young Darwin considered “both punctuated equilibria and phyletic gradualism as alternative narratives of the story of adaptive evolutionary change through time.” It turns out, Darwin based his theory on phyletic gradualism and he left allopatric speciation behind, which underpinned punctuated equilibria. Almost a hundred years later Theodosius Dobzhansky, then Ernst Mayr, resurrected this concept of allopatric speciation in their work. Then Eldredge and Stephen Jay Gould resurrected stasis, synthesized it with allopatric speciation and voila, punctuated equilibria re-emerged. Once a new species arrives, it’s usually here to stay for quite awhile. Humanity may just have that staying power. Another reviewer mentioned that this book was tedious at times and I agree. Maybe my scientific background isn't deep enough to judge fairly but I found it very rough going and a bit too technical for the average reader. I have found Gould and Thomas to be much more accessible. First of all, thank you Net Galley for the free reading copy. I was exceptionally excited to get this book, since I am taking a class from Dr. Eldredge this summer. This is very dense reading, so it is going to take me a while to "chew my way through." What I am seeing already is exactly what the book says it is: a complete history of evolutionary thought from humble beginnings to recent understandings. Right now I have finished the age of Darwin himself, Cuvier and Lamarck, Lyell and Hutton and First of all, thank you Net Galley for the free reading copy. I was exceptionally excited to get this book, since I am taking a class from Dr. Eldredge this summer. This is very dense reading, so it is going to take me a while to "chew my way through." What I am seeing already is exactly what the book says it is: a complete history of evolutionary thought from humble beginnings to recent understandings. Right now I have finished the age of Darwin himself, Cuvier and Lamarck, Lyell and Hutton and Wallace. Eldredge leads you then to how he developed punctuated equilibrium - again, this is not light reading, but for the eager accolyte. Eldredge began his undergraduate studies in Latin at Columbia University. Before completing his degree he switched to the study of anthropology under Norman D. Newell. It was at this time that his work at the American Museum of Niles Eldredge (born August 25, 1943) is an American biologist and paleontologist, who, along with Stephen Jay Gould, proposed the theory of punctuated equilibrium in 1972.